Wishing Stone Farm is located in Little Compton, RI. 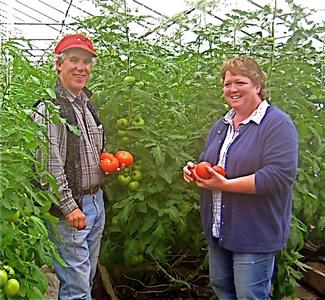 Wishing Stone Farm is certified organic on 35 acres of land on the coast of Rhode Island, and has been under the stewardship of Liz Peckham and Skip Paul since 1981. In the early years, they were a major force in the organic movement helping found and form NOFA-RI and serving on many multi-state committees and boards as the understanding of what organic meant began to coalesce. At the core of organic farming is the soil. Wishing Stone Farm strives to capitalize on nature's diversity by taking the proper steps to ensure the soil is as healthy as it can be. At the end of each season, the farm always protects the ground by putting cover crops on them for winter protection. They also go a step further and take all growing parcels out of production for one season at least once every four years. The purpose is to give the soil a rest so it may rejuvenate itself to sustain life for the upcoming generations. Check out a short video with beautiful shots of the farm; and includes Skip talking about the differences between organic and conventional farming (organic feeds the soil and conventional feeds the plants).